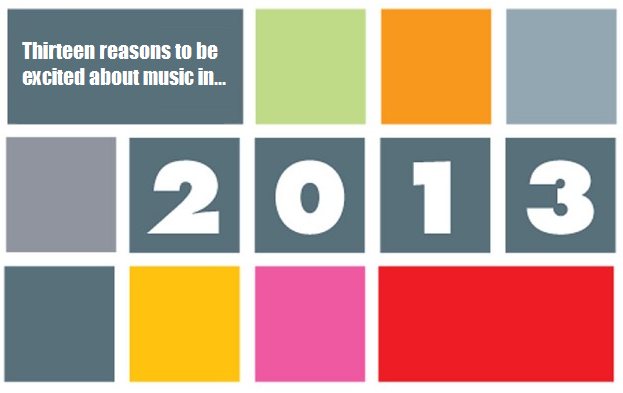 Thirteen Reasons To Be Excited About Music In 2013! 1. After ten years at Sony, Will Young recently signed a new deal with Island. It will be exciting to see where this new chapter takes him especially given his dalliance with uptempo beats and sounds on the magnificent ‘Echoes’ and his recent theatre work. 2. The return of Eliza Doolittle – from what we’ve heard, it’s sounding beyond amazing – so get ready! 3. The Lonely Valentine Club Tour from Nerina Pallot – a UK tour in February to showcase new material ahead of Nerina’s fifth studio album later in the year. For more details and tickets click here. 4. Beyoncé’s Superbowl peformance in February – it’ll be the perfect time and place to showcase an incredible new track (or two)! 5. What will be the biggest style or genre of music? The craziest fad or novelty? Will indie and guitars become fashionable and in vogue once again? The likes of Everything Everything, Delphic, Courteeners, Foals, Stereophonics and Biffy Clyro release new albums within the next couple of months, so could a musical shift happen OR will there be another explosion of K-Pop headed by PSY instead? Will David Guetta’s dominance continue? Will the promised revival of R&B slow jams come to fruition? Time will reveal all of course. 6. After an absence of 12 years, Cher will release a new studio album in 2013 – AMAZING! The line-up of collaborators is already impressive – Paul Oakenfold, Lady GaGa and P!nk. A world tour will also take place following the album release. 7. There will be plenty of shows and tours to look forward to from P!nk, Leona Lewis and Rihanna to Anastacia, Alicia Keys and Girls Aloud. So you don’t miss out, for those iPhone users, try the SongKick app – it scans your iTunes music library and tracks artists performing live in your area – it really is V V useful! 8. Lucie Silvas makes an long overdue comeback this year, following a five year absence. Lucie will release an EP in February – expect some live dates too! 9. The very amazing McFly celebrate their tenth anniversary with a Greatest Hits tour in May before unleashing their sixth studio album later in the year. 10. Returning old favourites – the likes of the mighty Gabrielle, Beverley Knight, Kylie, Mariah Carey, Avril Lavigne, Michelle WIlliams, Ciara, Kelly Rowland, Missy Elliott and Dido will all release new albums during 2013. 11. It will be exciting to see how the new artists and tips for the top fair – will they fulfil the weight of expectation or sink without making an impact? Debut albums from the likes of Sky Ferreira and Azealia Banks look set to be pure brilliance. Naughty Boy’s debut also looks set to immense! 12. Following the success of their debut records, we’re excited by the sophomore return from the likes of Diane Birch, Lissie, Hurts, Little Boots, CocknBullKid and VV Brown – will they capitalise on their initial success? 13. Rumours are always circulating but could 2013 be the year that Justin Timberlake makes a new album? We really really hope so! Fingers crossed everyone!!!! See you throughout the year, have fun and keep in touch with any recommendations – let’s compare notes on the other side!